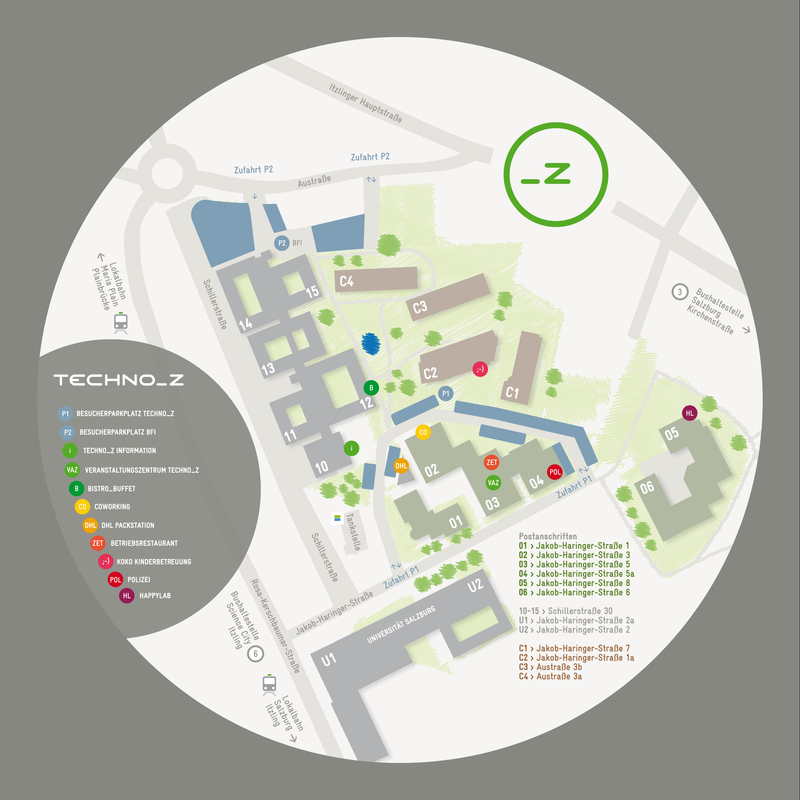 Trolleybus Linie 6: The Science City Itzling stop is directly in front of the Techno-Z Technology Park. Only three stops away from the Hauptbahnhof Salzburg train station. Timetables for trolleybus Linie 6. The Hauptbahnhof Salzburg train station is quite close: three stops with the trolleybus or about 15 minutes on foot. ÖBB timetable information. The Lokalbahn local train stops of Salzburg Itzling and Maria Plain-Plainbrücke are only a few minutes’ walk from Techno-Z. The Lokalbahn connects the city of Salzburg with northern Flachgau and runs to Ostermiething. Techno-Z is perfectly connected to the Salzburg bike route network. The best connections can be found on the Salzburg cycling map. Take the exit Salzburg Bergheim-West >> at the roundabout first exit towards city center >> at the next roundabout take the second exit on to Rosa-Kerschbaumer-Straße >> turn left at the first road on the left side on to Jakob-Haringer-Straße >> the Techno-Z visitor parking is the second road on the left side. Take the exit Salzburg-Nord >> direction city center >> turn right at the second traffic light on to Bahnhofsstraße in the direction of Itzling (Techno-Z signage) >> take the next right on to Kirchenstraße >> keep going to the Itzlinger Hauptstraße intersection >> turn right at the traffic light and then take your first left on to Austraße until you reach the roundabout >> take the third exit in the roundabout on to Rosa-Kerschbaumer Straße >> turn left at the first road on the left side on to Jakob-Haringer-Straße >> the Techno-Z visitor parking is the second road on the left side.